Soleus GPS 1.0 Reviewed - To Buy or Not in Apr 2019? Over the past five years, wearable activity trackers for runners have quickly become one of the most sought-after fitness accessories. It seems every quarter finds a slew of new sports watches hitting the market, each brand varying in quality, features, and price. Soleus Running has entered this crowded market and hit the ground running with a slew of fitness watch lines, each one with their own strengths and features based on price and purpose. The Soleus GPS One hews closer to a minimalist fitness watch, perfect for both running novices and experts alike. With a one-button start and a display that shows three different training metrics at a time, the GPS One is Soleus’s most simple running watch that has the core features runners looking to record their training data would want. With a built-in GPS, the GPS one monitors speed, distance, pace, and calories burned. With an ultra-thin profile that’s comfortable even on long runs and an 8-hour battery life, this watch is also waterproof up to 30 meters. While it isn’t a particularly flashy fitness tracker and lacks many of the bells and whistles that many other sports watches boast, its straightforward LCD display and basic features offers runners the basic features they need to keep close track on their performance. While the GPS One doesn’t store data (all previous data will be wiped out on your next run), but using a USB cord you can upload your daily workout data to any number of popular fitness apps. Also, this watch is great for the runner who’s still using paper logs to track their progress or knows their way around a spreadsheet will find that its basic features–of recording running time, pace, distance, calories burned, and its auto lap feature–just as much as they need to keep an accurate eye on their progress. Yes, the GPS One is a minimalist fitness tracker but it’s one that runners who only want these metrics recorded would need. 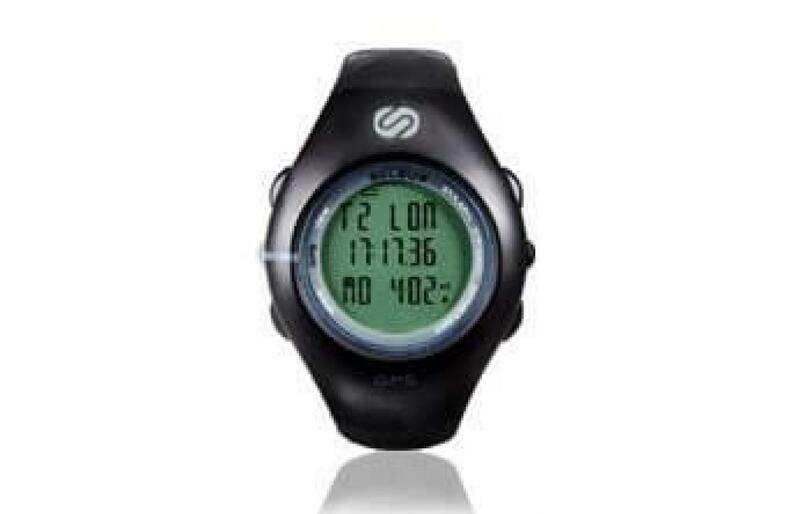 Listed at an affordable price, the Soleus GPS One is a great line to start with when it comes to fitness trackers. The bare essentials is what the GPS 1.0 offers, and its basic features speaks to this: it will record distance, speed, pace, and calories burned. And that’s pretty much it. But for runners who only want this data, it works great as a minimalist fitness tracker. In addition, it functions as an accurate timepiece. The one advanced feature of the GPS 1.0 is its built-in GPS. However, it does not use this function to display a map or track the runner’s route--it’s simply there to accurately record distance and pace. However, the Soleus GPS 1.0 has received some criticism that it takes a little too long to acquire a satellite signal. Overall, while the features offered in this fitness tracker may seem too basic for some runners, its built-in GPS helps record highly accurate data. When compared to other more expensive and complex fitness trackers, the GPS 1.0 holds up well in its accuracy. With just .01 mile off in comparative tests, its GPS function really aids in this. Considering its low price, and that it compares well with far more expensive fitness watches, the GPS 1.0 provides great accuracy at an even better cost. While it doesn’t have Bluetooth or wireless capability, the GPS 1.0 can upload its data to popular workout and running apps like Strava. However, interface with the computer requires some setup to pull the data off the watch. There is no dedicated app for the GPS 1.0, but its data can be uploaded via USB to any number of popular third-party running apps. One great strength of the GPS 1.0 is its comfort: with its ultra-thin profile that keeps the main unit close to the skin and being lightweight, this is a very comfortable wearable. Its band features numerous individual slats that allow for adjusting the fit based to personal wrist size, and runners have found the watch fit to be snug without being constricting and light enough that they almost forget they’re wearing it. With a rubber band that’s’ thick and durable, and a well-constructed one-piece main unit that’s protected by a plastic casing, the GPS 1.0 is a relatively durable fitness tracker. This speaks to the strength of its minimalist design that offers runners a strong, long-lasting wearable to use. While one of the smaller fitness watches on the market, the GPS 1.0 has a large and easy-to-read LED face. The watch displays three different readouts of various metrics at a time while running, and scrolling through and selecting your activities is easy and intuitive. The display is also customizable so the user can select which metric (speed, distance, or running time) is displayed most prominently. The face also comes with a night time mode, where the screen is back lit by a green light. Large and easy to navigate, the face of the GPS 1.0 is one of the most straightforward and easy fitness trackers on the market today. Two separate rubber units--each attached to the main unit at the top and bottom, respectively--comprise the GPS One’s band. Perforated with a number of holes on one side for excellent adjustability that will fit any sized wrist and with a small metal clasp to secure the fit, the band is as simple and straightforward as the rest of the watch. The GPS 1.0 only comes in one size, but its band is highly adjustable so it will fit the wrist of most runners whether they have thin or thick wrists. The main unit has an ultra-thin profile for a fitness watch, however, so runners will appreciate how comfortable and unobtrusive it is when they wear it. This activity tracker is also one of the smallest GPS-enabled sports watches on the market, which means runners may end up using it as an all-day watch to wear. Although the Soleus GPS One is a minimalistic wearable that functions as a fitness tracker, the metrics it does record--running time, distance, pace, calories burned, and auto splits that reset per mile--are easy to find and navigate within the watch. The four analog buttons arranged on the outside of the watch are how the runner navigates through the menus, which is intuitive enough to understand after a few minutes of just testing out the watch. Meanwhile, uploading data to a third-party workout app is relatively simple after installing the Soleus drivers to one’s computer--however, this is another analog feature that can only be accomplished via USB cable to one’s computer. The GPS 1.0 is charged via USB cable, which is a convenient power source for the tech-savvy runner. One of its best attributes is the long-lasting charge the lithium battery holds. Its battery life lasts for 8 hours with the GPS running and up to a week without, which runners who also want to use the GPS 1.0 as a full-time timepiece will appreciate. Hands down the single best attribute of the Soleus GPS 1.0 is its price. Coming in under $100, this is an exceedingly affordable fitness tracker. And while it may have some limitations, such as not storing data, for example, or that its GPS function is only to aid in the accuracy of the metrics recorded but not as a map function, for its price, the GPS 1.0 is a great value buy for beginners that don’t want to take the investment plunge higher-end fitness watches like a Garmin or Apple Watch. Even experienced runners that prefer to have a more hands-on approach when recording their fitness tracking and are more concerned with comfort and recording their basic metrics rather than having all of the bells and whistles of which some other wearables boast. Although the Soleus GPS 1.0 is a minimalist watch it still has a fair amount of accessories available for it. Besides the USB charging clip that comes with the watch, a charging extender, mount for one’s bike, and various replacement charging cables with clips are also available. - Highly accurate recording of speed, distance, pace, calories burned, laps, and running time. In a crowded market, many companies begin to overload their fitness watches with too many options - color screens that show potential routes tracked by GPS, multi-sport watches whose many features are often not used by runners, and fitness trackers that double as MP3 players and smart watches. More often than not, however, these are extraneous features that most walkers and runners will never access--but still end up paying high prices just for the basics. As an antidote to this problem, the Soleus GPS 1.0 strips away all of these unnecessary features and just provides runners with the basic functions of recording speed, pace, calories burned, laps, distance, and running time. Truly, the GPS 1.0 is only concerned with the essentials. Although it has a built-in GPS, this is just there to provide a more accurate recording of these metrics, and its black-and-gray LED face is easy to read and navigate. Although there are some slight “extra” features--it’s waterproof for up to 30 meters and provides a back lit face for night running--this is a minimalist running watch. Slim, lightweight, and comfortable, the GPS 1.0 can be used as a solid fitness tracker while also functioning as a highly wearable timepiece. Stylish and straightforward to the point of being nearly indiscernible from being a digital watch, runners that don’t want to concern themselves with complex menus and hard-to-read interfaces. Analog buttons are used for navigation and selecting functions and up to three metrics can be displayed at a time. Although it does not store data past the most recent run, recorded data can be uploaded to third-party apps via USB cable to the computer. So yes, the Soleus GPS 1.0 is not a particularly complex fitness watch. But for its incredibly low price, excellent accuracy in recording important metrics, and comfort, runners both old and new will find a useful fitness tracker that will provide what they’re looking for in a sports watch. It may not be high-tech or flashy, but runners that want only the basics in their fitness watch will find the Soleus GPS 1.0 an incredible value and great aid in recording and pursuing their running goals.